The world’s largest megalopolis is currently the Taiheiyō Belt (the Pacific or Honshu megalopolis). It is located on the southeastern Japanese island of Honshu. Part of the archipelago that forms the country of Japan. Its population as of 2005 is 103 million people living in an area of 88,996 sq miles (230,500 km²) which is roughly about the size in square miles of Michigan or Minnesota. 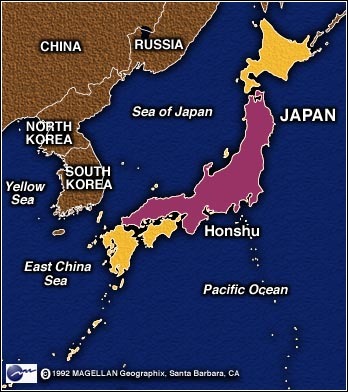 Map northeast Asia highlighting Honshu in the Japanese archipelago. The Taiheiyō Belt (also known as the Tokaido corridor) consists of the metropolitan areas of Tokyo, Kawasaki, Yokohama, Shizuoka, Hamamatsu, Nagoya, Kyoto, Osaka, Kobe, Okayama, Hiroshima, Kitakyushu, Fukuoka and their surrounding cities and towns extending from Ibaraki Prefecture in the north all the way to Fukuoka Prefecture in the south, running for almost 1,200 km (750 mi). The population of this megalopolis is considered to be as high as 83 million people, depending on where one draws its boundaries. 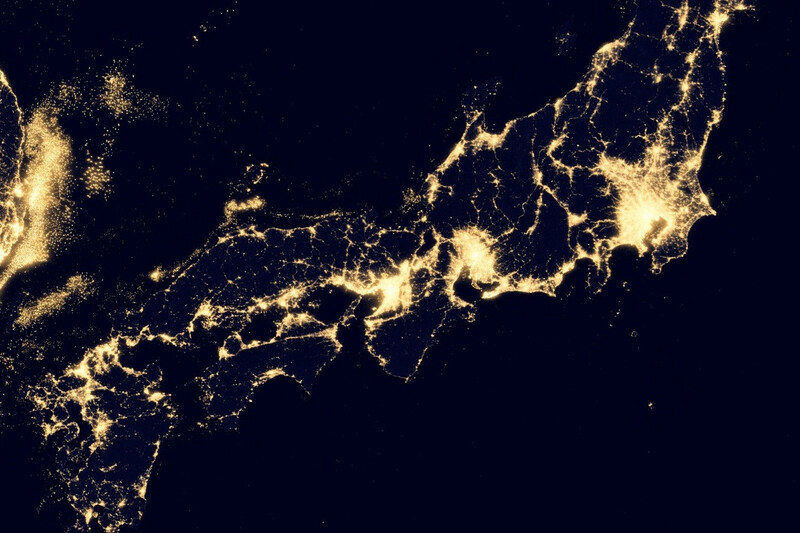 Satellite image of Japan at night. The brightest areas from right to left are Tokyo, Nagoya and Osaka. Guangdong Province’s Pearl River Delta is a megalopolis with a population of 48 million that extends from Hong Kong and Shenzhen to Guangzhou, approximately 39,380 km2 (15,200 sq mi). Some projections assume that by 2030 up to 1 billion people will live in China’s urban areas. Even rather conservative projections predict an urban population of up to 800 million people. In its most recent assessment, the UN Population Division estimated an urban population of 1 billion in 2050. Map of China’s Pearl River Delta. Illustration of China’s Pearl River Delta. The Dallas-Fort Worth-Arlington, TX Metropolitan Statistical Area, the official title designated by the United States Office of Management and Budget, encompasses 12 counties within the U.S. state of Texas. The area is divided into two distinct metropolitan divisions: Dallas–Plano–Irving and Fort Worth–Arlington. Residents of the area informally refer to it as the Dallas/Fort Worth Metroplex, DFW, or The Metroplex. It is the economic and cultural hub of the region commonly called North Texas or North Central Texas and is the largest land-locked metropolitan area in the United States. The 2011 official estimate U.S. Census has the Dallas-Fort Worth Metroplex at 6,526,548, making it the largest metropolitan area in the South. During the 12-month period from July 2008 to July 2009, the Dallas–Fort Worth–Arlington metropolitan area gained 146,530 new residents, more than any other metropolitan area in the United States. The area’s population has grown by about one million since the last census was administered in 2000. 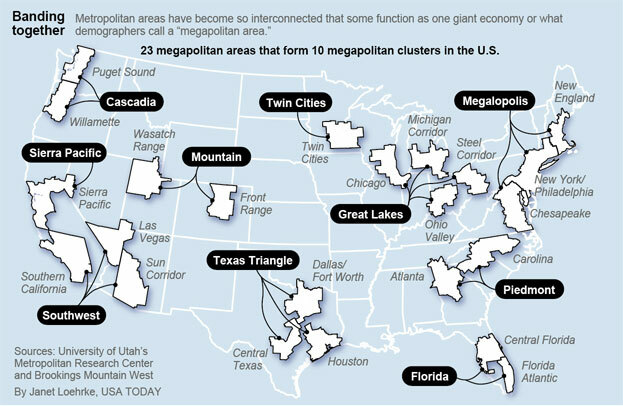 The Dallas–Fort Worth–Arlington MSA is, by population, the largest metropolitan area in Texas, the largest in the South, the fourth-largest in the United States, and the tenth-largest in the Americas. The metroplex encompasses 9,286 square miles (24,100 km2) of total area: 8,991 sq mi (23,290 km2) is land, while 295 sq mi (760 km2) is water, making it larger in area than the U.S. states of Rhode Island and Connecticut combined. It is also the sixth largest gross metropolitan product (GMP) in the United States, and approximately tenth largest by GMP in the world.